Oh, and many, many thanks to Paul Harden NA5N for hosting this really fun QRP event year after year and doing all the hard work that it takes to keep something like this running. My lunch time QRP session was the pits. I didn't work anyone and I kept getting jumpy SWRs. The KX3 kept wanting to re-tune and I couldn't get a decent SWR on 15 Meters, which had never been a problem until today. Last night, I re-soldered the connections to my magmount as the shield connection snapped. I brought the base in last night, cleaned everything up and re-soldered the wires to new connectors. When I reassembled the pieces, I thought I had screwed everything down tight. But when I took the Buddistick apart today at the end of my lunch time session, the threaded stud part of the magmount, that the radiator screws into, was turning pretty freely. Obviously, I didn't tighten things as well as I had thought. I took care of THAT this evening with the help of two good Craftsmen Hex Grip wrenches. Tomorrow should be better. Even if I don't end up working anyone, the KX3 should be a happier camper than it was today. Tonight however, was a different story. I worked W1AW/7 in WY and W1AW/0 in MO on 30 Meters, back to back. Then I hopped on over to 15 Meters just in time for the grayline to give me a hand. Although I used QRO power (75 Watts), I was able to snare two good ones - E51KJW, South Cook Island and FW5JJ, Wallis and Futuna Islands. I had to work FW5JJ twice, as the first time he had me in his log as "W2LO". Big time dilemma. At that point, what do you do? I knew he had me wrong, but I didn't want to call again right away, so I went and worked E51KJW who got my call right the first time. After working Nakayama, I thought I'd give FW5JJ a second shot. I was worried that I would get the dreaded "WRKD B4", but this time he heard me correctly and I clearly heard "W2LJ" this time. 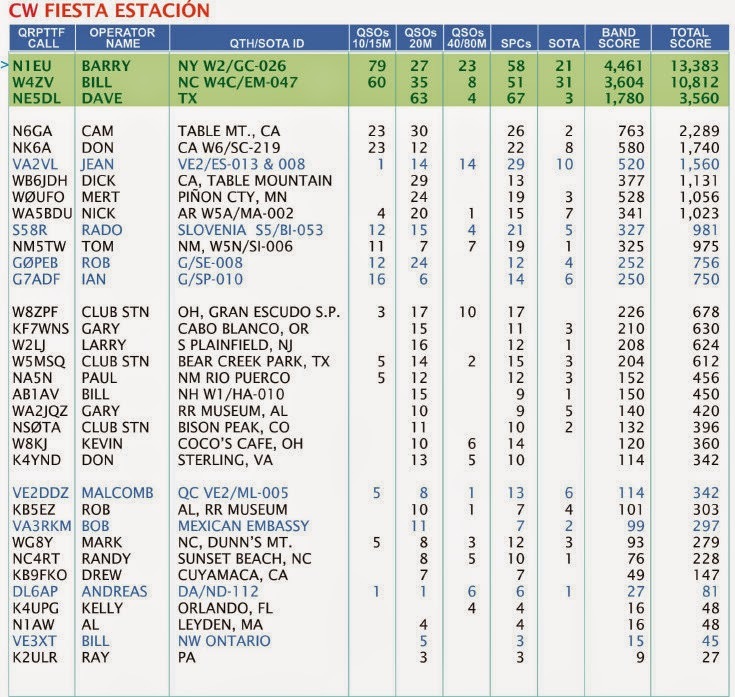 Two new DXCC entities in the log - Booyah! Going to shut the rig down now and head upstairs to watch "The World Wars" series that is running on The History Channel. I've been watching it since Monday night. So far it's been a very good documentary assessing how World War II was really just a continuation of World War I. 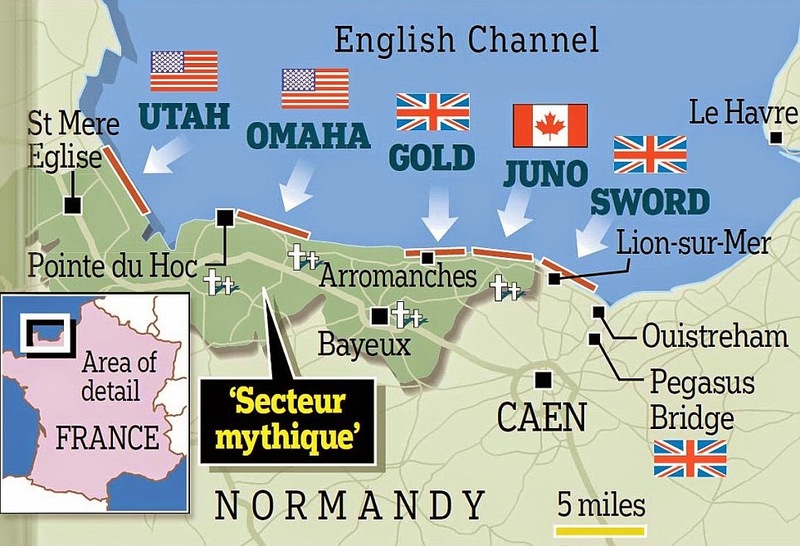 And although I always considered myself pretty familar with the histories of both wars, there have been some new tidbits of information that were new to me, which is always fun. Disappointingly, there was not a lot of activity last night in the QRP ARCI Hoot Owl Sprint. My guess would be that between the CQ WWPX Contest and Holiday weekend BBQs and other activities, that most folks were probably too pooped to pop. I was on for approximately 2 and 1/2 hours, from 8:30 PM local time to 11:30 PM local time (0030 - 0300 UTC). I worked a total of 17 stations - mostly up and down the East coast. I did work John N0EVH in Missouri and I did have a nice little QSO with Rumi LZ2R who was calling CQ USA from his QTH in Bulgaria. He was running his K3 at 5 Watts and we were 569 both ways. I think he was looking for counties, but I got the exchange needed for the Sprint, so as far as I'm concerned, it counts and it was by far my best DX for the night. The last 1/2 hour, from 0230 to 0300 UTC was just me calling CW with no takers. That's when I decided to pack it in for the night. The KX3 was plugging away calling CQ and I started nodding off a little bit. I'm sure if there was more activity, I would have stayed on until the allotted time was up, which would have been local Midnight (0400 UTC). But the rig automatically calling CQ over and over is kind of like driving down a long highway in the rain with the windshield wipers on. The constant rhythm of CQ with no breaks can kind of lull yout to sleep. According to Reverse Beacon Network, there is how I was being heard last night. I spent just about all of my time on 40 Meters. I did make one QSO on 80 Meters and three on 20 Meters, featuring the one with LZ2RS. Other than that, everyone seemed to be concentrating on 40 Meters in the 7.030 MHz neighborhood. As far as antennas go, I was using mostly my 88' EDZ on 40 meters and for my very brief foray into 80 Meters. On 20 Meters, I used the Butternut HF9V. If the shirt I'm wearing had buttons, they'd all have popped! Me: Good! You got a ride. Me: I guess Cara's happy. Joey: Yes she is. 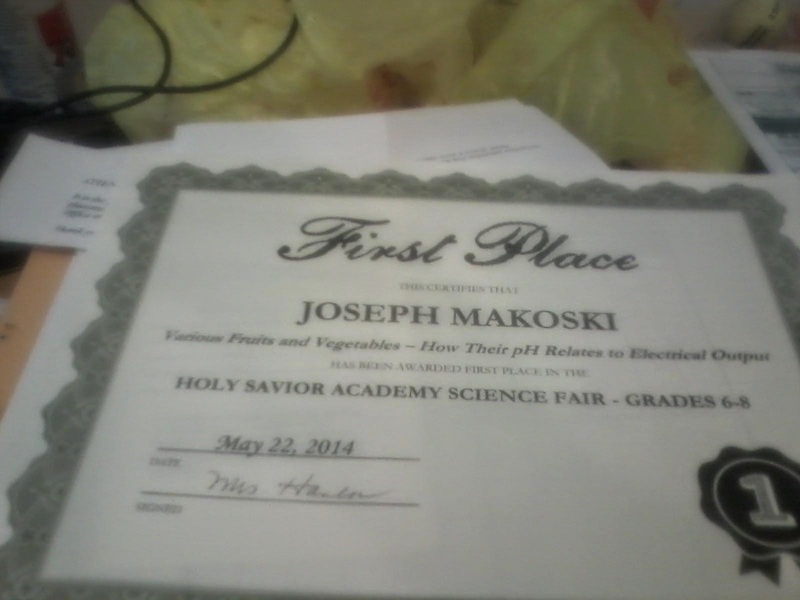 Guess what place I got in science fair. If this golf shirt that I'm wearing had buttons on it, they'd all have popped by now. I am so proud of Joey and Cara, they are both great kids. God has truly blessed me. In a recent post, I had mentioned how I had purchased two refurbished Windows 7 computers from the Blair Group via eBay. One was to replace the family computer that died, and the second was to replace my shack laptop that has seen better days and is in the throes of dying. I just wanted to mention that so far, I am pretty well pleased with both machines. I spent $139 for each, which is a bargain when you take a look at the price of brand new computers today. But when you're saving up for a new radio accessory (PX3), you have to save pennies when and where you can. Each computer is a basic box with Windows 7 installed. You might consider them a bit behind the current OS curve, but for me, this was a step up from XP and Vista. These are very basic computers, with no fancy software bundles, and I like that. A lot. I don't need a fancy or overloaded desktop as everyone in the house does basic Web surfing and e-mail reading through tablets now, anyway. The family computer is now basically a homework and formal document machine and you all know what the shack computer is, more or less. If I get 4 or 5 years from each of these, I will be happy. So if you're in the market for an inexpensive, yet decent machine, check the Blair Group on eBay. They do a good job. One of my favorite contest/Sprints is coming up this weekend. 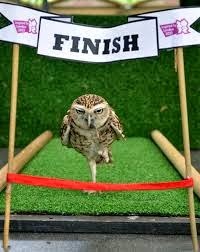 The Hoot Owl Sprint, sponsored by QRP ARCI is this coming Sunday evening. I guess I had lost focus, or wasn't paying attention, as this came as a surprise to me when Jim W4QO announced this on the NoGA Group reflector yesterday. 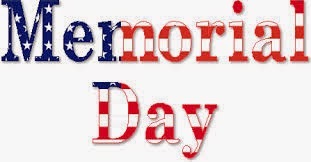 The Hoot Owl Sprint is always held on Memorial Day Weekend, here in the US. The rub is that it doesn't feel like Memorial Day weekend as far as the thermometer is concerned. It feels more like late April or early May around here. It's been chilly and wet for the most part, lately. We have had very few days where the temperatures have gone into the mid or upper 70s. And the forecast for the weekend is for basically more of the same. Ugh. I am hoping that it will stay dry enough so that I can test out a 53 foot radiator with the 9:1 UNUN at the park at some point this weekend. According to the SWR Chart on the Balun Designs website, a 53 foot radiator will yield decent SWRs on all bands 80 through 10 Meters. If I get an opportunity to play and the results bear out, then this will be one of the antennas that will be used at the SPARC Field Day effort. I guess you could say that tonight was the first, formal meeting of a new Amateur Radio club. The newly formed South Plainfield Amateur Radio Club (SPARC) now lives. Up until now, we were an "informal' club, a loosely knitted confederation of Amateur Radio operators who gathered under the CERT umbrella to provide community service to our town. But now we have a formal constitution and by-laws and we now fall under the banner and protection of the South Plainfield Office of Emergency Management. Our major purpose is to provide communications and service to the OEM and the town of South Plainfield, NJ. The club documents were signed by the charter members, of which yours truly, is one. I was appointed to be Trustee of our Club Callsign NJ2SP., which really is just a continuation of what I had been doing. Our secondary purpose is to highlight Amateur Radio to the public, as well as to try and introduce Amateur Radio to the youth of our town and the surrounding area. One of the ways we hope to do that is by sponsoring a prominent Field Day effort in a very public park in town. 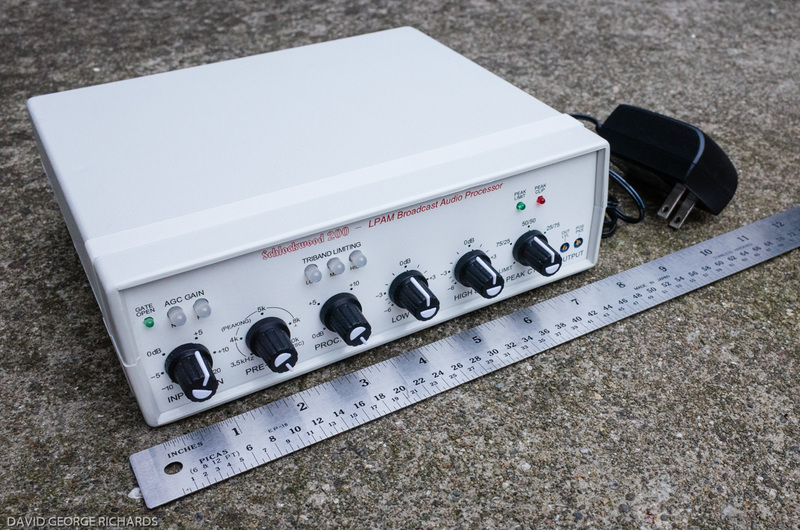 Since time is short, it was decided to put forth as simple an effort as possible, so we will be doing a two station QRP setup - one station SSB and one station CW. Since I seem to be the "QRP Guy" in town, I was made Field Day Committee Chairman. Yikes! It looks like we'll be using my two KX3s and some simple wire antennas. While South Plainfield has its share of parks, there are two in particular that have very high visibility. 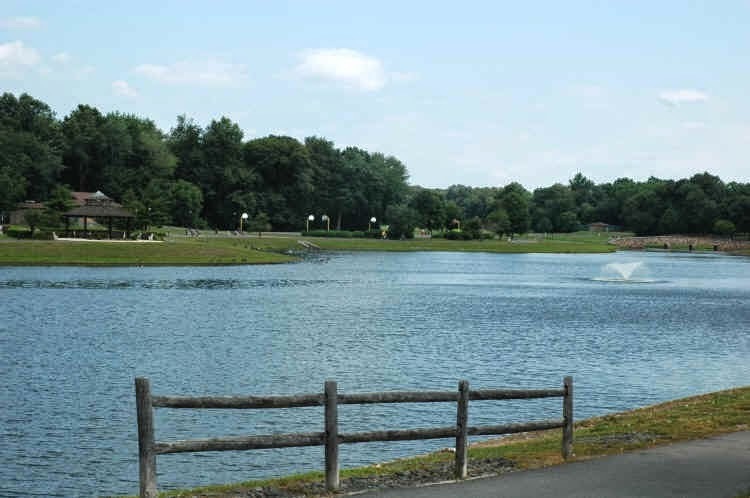 The first is Spring Lake Park, which is actually part of the Middlesex County parks system. That gazebo to the left in the picture would offer a nice shelter in the even of inclement weather. The other possibility is Putnam Park, a municipal park which has the advantage of being at the intersection of two major roads in town. It sees a lot of traffic and has lots of tall trees, also. The only disadvantage is the lack of a shelter. We would have to procure some kind of tent, canopy, or other portable shelter. Time is short, and this is definitely going to be a "fly by the seat of the pants" effort at this point. The main goals will be to have fun and garner some publicity for SPARC and Amateur Radio in general. Since this looks like it's going to be a QRP expedition on steroids, maybe I can get the other guys in town to be bitten by the "QRP Bug". Happy 100th Birthday, ARRL! You don't look a day over 50! I wonder if there will be another special stamp issued this year? Once again, I do not have the good fortune of being able to attend FDIM and Dayton. Attending FDIM is like, #1 on my wish list, but not this year and probably not next year, either. Joey's Confirmation is this weekend and next year, Cara's will be the same weekend. So maybe FDIM 2016? I can always hope! But even though I'm not there, I do have the symposium running on a separate tab and I am listening, while working. http://www.ustream.tv/channel/g4gxl-test is the link, for those of you not in the know. What I am listening to is mostly over my head. I'm not a technical wizard by any stretch of the imagination. Most of these guys making presentations are using transporters while I'm still rubbing two sticks together, trying to make fire. That said, it's still fun to listen to. Craig Behrens NM4T gave a talk that I am actually able to follow and enjoy - same for Rev. Dobson's talk on regenerative receivers earlier this morning. And right now there's a fascinating talk being given about WWII POWs building clandestine radios by Dave Cripe NM0S. Man, I wish I were there! All this talk of Arduinos has me curious. There's a guy who comes to all the NJ Hamfests who sells beginner kits and I have that ARRL Birthday Month coupon kicking around - and they have a good book on Arduino experimenting, if I remember correctly. Intriguing (like I don't have enough to do!). This afternoon during lunch I had a cool QSO with Gary WA2JQZ who was operating the Marshall Spaceflight Center ARC station WA4NZD. Gary was using a Yaesu FT950 at 5 Watts to a dipole. He was a good 579 or louder here and I got a 559 in return. I had actually worked Gary a few weekends ago during QRPttF. So we talked about that among other things. And I hope I'm not "talking out of school" here, or giving away state secrets, but Gary shared some information that I am going to pass on. Please listen for N4A later on this year, sometime towards the end of July. The Marshall Spaceflight Center ARC will be using that call to run a Special Event station honoring and commemorating Apollo 11 - which of course, landed on the Moon in July - July 20th, 1969 to be exact. I'm not sure when they will be on, but I am sure there will be announcements in all the usual places. Update - Congrats to TJ Campie, W0EA (fellow blogger) who won one of four TenTec Rebel radios, which were given as door prizes today at FDIM. It was neat to listen in as his name was announced. 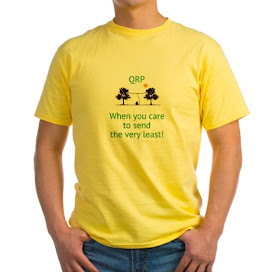 QRP - When you care enough to send the least! 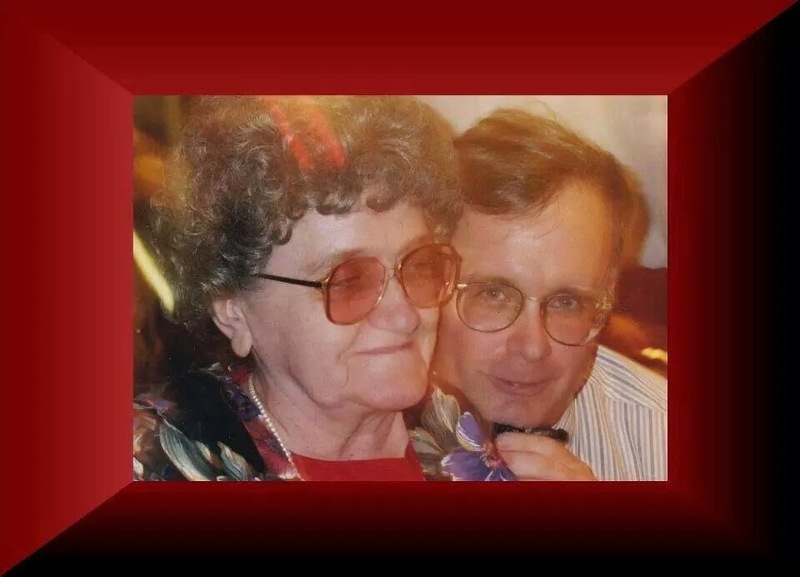 Today, sadly, marks the two year anniversary of the passing of my Mom. Some days, it seems like her passing happened so long ago. Other days, the pain is as raw as if it had just happened. I know they say that time heals all wounds, but there are some things you never get over. And to be honest, I would rather feel the occasional pang of grief than become complacent about her death. There are indeed moments when the emptiness and sadness still rear their ugly head. Fortunately, those sad times are farther and fewer between, and there are many times when the memories invoke moments of joy and laughter or a smile. In a related matter, the friend of a friend passed away in early April. I mention this, because some of you may have known him - some well, others just in passing. The person I am referring to is Bill Stevenson G4KKI. Sadly, Bill passed away from cancer in early April. Bill was one of the "QRP family", a FISTS member, an antenna experimenter and he loved going on portable QRP operations. 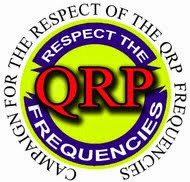 Bill contributed a lot to the various QRP lists with posts about his successes with homebrewing rigs, magloops, and his various portable QRP ops expeditions to various places in his beloved home of England. A person once said that, "Everybody wants to go to Heaven, but nobody wants to do what they have to do to in order to get there - die." I suppose that's true, but sometimes I think the heavier burden is left with those of us who stay behind. Yesterday, the bands seemed a little on the "light side" when I headed out for lunch. Both 15 Meters and 17 Meters had some signals, but it seemed like most of the DX stations were ones I have already worked before. So I decided to go to the 20 Meter QRP watering hole and put out a CQ. I was answered by Bob AK4JA in Georgia. He was a solid 589 at peaks and he gave me a similar signal report. Here's the thing - while I was using my normal 5 Watts, Bob was running 500 mW! And his signal was fantastic! While I am fully aware how QRP signals don't necessarily equate to "weak signals" - even I stand up and take notice when a QRPp signal almost pins my meter. I kind of felt like this guy - remember him from TV commercials a few years back? 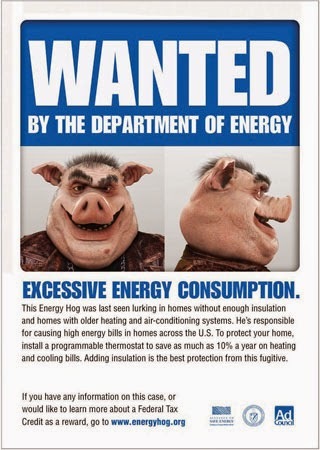 For those readers not from the US, the Department of Energy ran a series of public service announcements a few years back asking people not to be "Energy Hogs". Normally, running 5 Watts can make you feel smug with that regard. Yesterday, using even 5 Watts made me feel piggish. For the record, Bob was using a Yaseu FT817 to a dipole - and it was doing a fantastic job for him. His 1/2 Watt signal almost sounded like he was transmitting from a location just down the street. When I got home a "new" computer was waiting for me. I purchased a refurbished Dell Optiplex 320 from the Blair Group via eBay. This was the same place from which I had purchased a Compaq to replace the family computer which died a few weeks back. For a very good price (under $150), I got a Windows 7 box to replace my shack laptop, which is not only an XP machine, but is physically on its last legs after suffering through years of "kid abuse". I figured that it's better to replace it now, while the laptop is still barely kicking, so I can access all the data that is still there before it totally dies. As it was, I was already using an auxiliary keyboard and monitor, so I only had to purchase the box. So I ran through the Windows 7 setup with nary a hitch. But then, of course, comes the fun part. Getting all the important Amateur Radio programs up and running. I downloaded Log4OM and got that running. I followed the directions for transferring all my log data and configurations from the XP machine to the Windows 7 machine. Everything seemed to be OK - except the program wasn't displaying any of my previous QSOs! Log4OM said they were all there, but it just wasn't showing them in a visible way. It turns out that the W2LJ.sql database file needed to be in a different sub-directory than where it was located on the XP machine. Once I got that figured out, things were good. 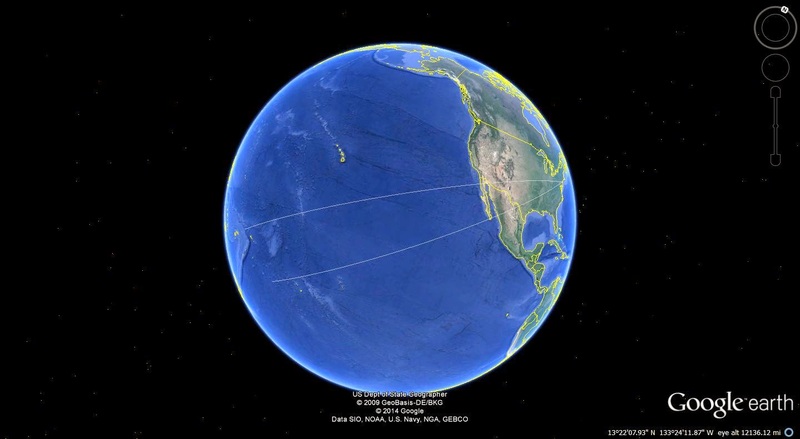 But for a while there, the little beads of sweat started popping out on my forehead while I started muttering to myself, "Where are all my QSOs?" The next problem to tackle was downloading the KX3 and KXPA100 utility programs from Elecraft in order to get them running, as well as OmniRig for CAT control for Log4OM. Downloading and installing the programs was easy enough - the computer did all the work while I tuned around 20 Meters. The hard part was figuring out why the computer didn't want to talk to the KX3 or the KXPA100. For whatever reason, it didn't turn out to be as "plug and play" as it sometimes is. Every time I tried to get the KX3 utility to talk to the KX3 - nada, zip, zilch. The radio and computer were acting like a husband and wife after a marital spat - not talking to each other. It appears that the KX3 was looking to talk via Com1 - but that was being used by another device. And when I hit the "Scan for Ports" button on the utility, that was all that I was getting. That caused me to make a sharp right turn and head off to the dreaded Control Panel and even more dreaded Device Manager. For those of us who don't consider ourselves to be all that computer savvy, this is terrifying territory. Kind of like walking through the Valley of the Shadow of Death. But it was there that I was able to scan for hardware changes, open another port (Com 3) and load the drivers for the Elecraft KXUSB cable. After that, the KX3 and Log4OM and the utility programs and the Dell were all smoochy-smoochy like a newlywed couple. Satisfied that I got the very basics covered, I looked up at the clock to discover that it was after Midnight. Holy cow! When you get up before 6:00 AM, post Midnight is late - very late! I still have to download and install Avast (one of the first things I did was to uninstall and trash Microsoft Security Essentials, which IMHO is useless). After that, there are a few more remaining Amateur Radio programs that I have to re-download and get running - like DX Atlas and TrustedQSL for instance. Then I need to transfer accumulated documents and photos from the laptop and then I can finally say "Good-Bye" to Windows XP. And that, in itself is kind of sad, as I consider XP to be the most stable and useful platform that Microsoft has ever come up with. If it wasn't for the fact that my laptop looks like Rocky Balboa after a tussle in the ring with Apollo Creed, I probably would have kept it going for a while longer. However, time marches on and I suppose it's appropriate to modify that well known saying - "Time and Microsoft wait for no man". I was chasing Saudi Arabia on 17 Meters tonight. 7Z1HL was on the air and was working mostly W/VE stations. I boosted up the power to 90 Watts and joined in the fray. I have never worked Saudi Arabia before, so this would have been a new one. Finally - finally he comes back to W2L? So I start sending my call several times. Can someone, for the love of Pete, please tell me why a W6 station would start calling on top of me when 7Z1HL clearly asked for "W2L?"? I didn't make it through, so again he sends, "W2L?". Again, the same W6 station takes it upon himself to QRM me. Sadly, all I got for my effort was "SRI W2L? QRM NIL". And he moved on. Nuts! - for lack of a more appropriate sentiment. The weather has taken a decidedly summer-like turn in central NJ. At lunch time today, the outside temperature is a June/July like 84F (29C). You will not hear a word of complaint out of me, that this is too hot, considering how long and extended our winter was. I'll take this any day of the week! As the situation at work returned to somewhat normal, I was able to head out to the Jeep this afternoon, for my hour long break. I was able to work out of the back, with the rear tailgate open, providing a bit of shade from the Noon sun. 15 Meters and 17 Meters seemed to be the active bands. 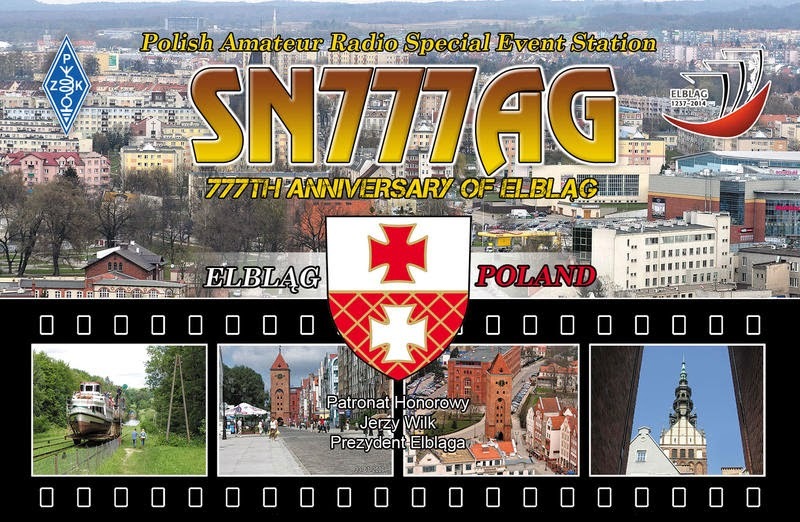 On 15 Meters, I worked SN777AG - Jurek SP2GUB who was commemorating the 777th Anniversary of the City of Elblag, which is not far from Gdansk. After SN777AG, I worked Jose EA1MX in Spain. QSB got the better of that QSO. We were able to exchange rudimentary RST information, and that was about it. I'll count it as complete QSO, but I hate when QSB kills an opportunity for more. I then hopped on over to 17 Meters, where I worked EM90WF in the Ukraine, another Special Event Station. This one was to commemorate the 90th birthday of Vladimir Goncharsky U5WF (SK). Vladimir was not only a very successful Ham who had won many awards, but was also a WWII veteran. The station was loud into NJ - very loud. This is not the first time I have heard them, or have tried to work them, as I'm always attracted to very loud signals from DX stations. Attempts to work EM90WF in the past were unsuccessful. In fact, a few weeks ago, I spent one or two lunchtime sessions trying to break the pileup, fruitlessly. Today? First call - go figure. While talking with my bud, Bob W3BBO today, we discussed an instance that we had both heard, of a Ham who was selling all his equipment. It appears this operator feels that he has reached the pinnacle of the hobby by working all the DX that there is to work, "So there's nothing else to do", and he's packing it in. Bob and I were both incredulous. He's been in the hobby for over 50 years and I have been in the hobby for 36 years now. I do understand that with any undertaking, there are ebbs and flows of enthusiasm and interest. You might be super active for a period and then lose steam for a while. It might even reach the point of becoming temporarily inactive. And as John Lennon famously said, "Life is what happens when you're busy making other plans". Life circumstances change, as do priorities. But to chuck everything and get out of the hobby because you have "done it all?" I don't think that's even possible! So let's say you've been fortunate enough to work 9 band Honor Roll ....... there's nothing left? 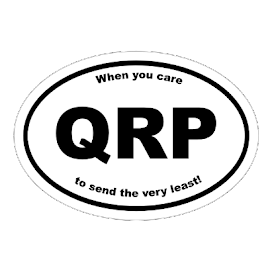 How about (wait for the plug) trying to do it again using QRP? Or how about getting into satellites, or digital modes, or perhaps taking a shot at working all counties? 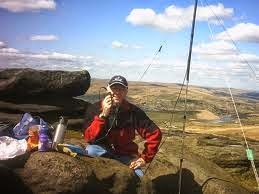 I have a friend, Dr. Paul Scipione AA2AV, who has worked all counties three separate times - SSB, CW and CW QRP. That's an accomplishment! Build something, go hilltopping or become active in SOTA or IOTA, go on a DXepdition! Bounce your signals off the ionized trail of a meteor, or the moon. 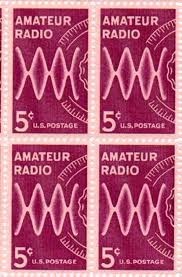 My point is, Amateur Radio is actually a hobby built up of sub-hobbies. There's always something new to try and undertake. The day someone actually does end up "doing it all" will be a very special day, and I'd like to meet and shake that person's hand. For indeed, that person will definitely be very special, and I think I would love to read whatever book they choose to write about their adventures. "Hey, Dad ...... do you have a meter that will read really small voltages and tiny amounts of current? ", my son Joseph asked the other week. "Joey, I'd better! I'm an Amateur Radio operator, and I was an electronics technician for 22 years. ", I replied. And so began the 2014 8th grade Science Fair project. My son decided to see how the pH of a fruit or vegetable would affect its ability to generate electricity. His hypothesis - the more acidic the fruit/vegetable, the more power would be generated. The materials were an apple, a lemon, a pear and a potato. A head of red cabbage was procured to act as a pH indicator. Zinc screws and 3 inch pieces of #10 gauge copper wire served as electrodes. Before we began generating electricity, my wife boiled some leaves from the cabbage in a pot of water. The resulting liquid would act as our litmus paper. I stuck a screw and a piece of the copper wire into each piece of produce. The positive lead from the meter went to the copper wire and the negative lead was attached to the zinc screw. We measured both voltage and current, to be able to calculate Watts. A teaspoon of the cabbage water was put into four glasses. Juice from each piece of produce went into the purple cabbage water. If the cabbage water turned blue, it would indicate a base. If the water stayed purple, the pH would be neutral. An acidic pH would turn the cabbage juice pink. From lowest output to highest were - potato, pear, apple, lemon. And in turn, the potato had the lowest pH, while the lemon had the highest. The voltage and current readings followed the pH indications. It seems my son's hypothesis was correct! Now all Joey has to do is make a graph, print out the pictures we took and write up an explanation of what was observed. The really neat thing was that he had a good time and really enjoyed himself. I'm not sure what he wants to be, someday; but something in the scientific or electronics field would not be so bad. 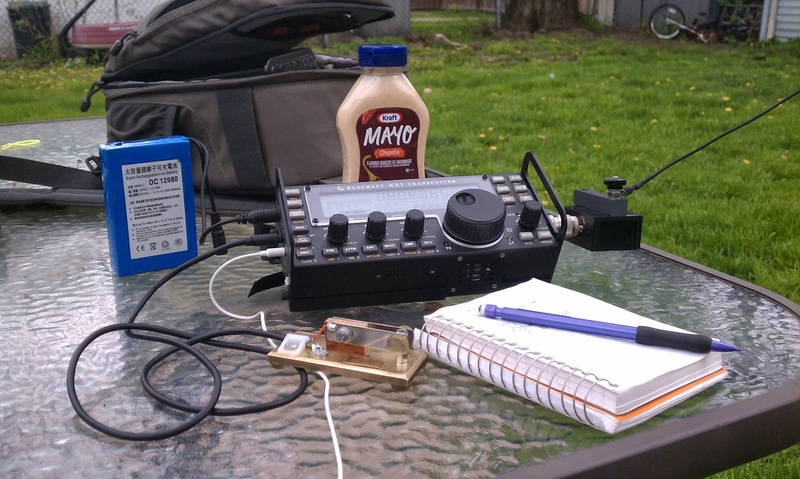 Today was QRP to the Field for 2014, and it was also my birthday. What a present! Although I didn't get to spend anywhere near as much time on the air as I would have liked, I got a little air time in and that's always a good thing. The theme for today was Tres de Mayo in honor of Cinco de Mayo. Well, here in New Jersey there really aren't an abundance of locales with a Mexican flair. So I got a little creative. Yes, I placed some Chipotle Mayo next to me while I operated. I got to experiment a bit too. I used both my Par EndFedz and the EARCHI 9:1 Unun with a 36 foot radiator. The Par EndFedz performed as expected. The EARCHI performed much better than last time. The extra three feet of wire made a big difference. The KX3 handled the wire well on all bands, 40 through 10 Meters with minimal clicking and clacking from the auto tuner. In the hour or so of operating time that I got in, I worked about a dozen or so stations. Included were some very familiar calls like Mert W0UFO, Jerry N9AW, Rick NK9G, Dave AB9CA, Gene N5GW and Kelly K4UPG among others. So even though I didn't get a lot of operating time in, I did learn more about the EARCHI end fed. I think it will serve well as an all around multi band antenna for portable ops.